rec. July 2010, Sala Santa Cecilia, Auditorium Pardo della Music, Rome. 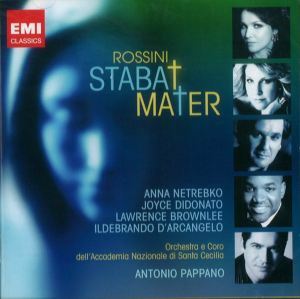 After his hugely successful release of Verdi’s Requiem a year ago, Pappano stakes his claim to another Italian choral masterwork in Rossini’s Stabat Mater and the results are magnificent. Pappano, in fact, sees the Stabat Mater as a forerunner of the Verdi Requiem saying, “The desperation and the drama is already there”. And how! As with Verdi’s Requiem any conductor has to make his decision about whether this is a work of spiritual devotion or operatic drama. Pappano nails his colours to the mast from the outset: he sees this as a work of red-blooded Italian passion, a natural successor to Rossini’s operas. Listening to it I only once felt drawn towards the devotional: everywhere else Italian passion courses and burns through this work, and it is all the better for it! Pappano drives the music forwards with red-blooded vigour but it never sounds coarse. After the eerie opening the main chorus and quartet beat with strident fervour, and the control of both orchestra and soloist in Pro peccatis is energetic and purposeful. The Inflammatus is hair-raising and the final fugue utterly electrifying. Only in the final quartet, Quando corups morietur, did I feel him drawn more towards the devotional end of things, but this was welcome in the midst of the surrounding drama. The orchestra play for him like gods, utterly in tune with his concept of the piece and finer, even, than they were in the Verdi Requiem. He has done a wonderful job with them since taking over as their director and this disc is their finest achievement to date. We are lucky indeed that Pappano can tempt such a starry line-up of soloists to join him in Rome. Anna Netrebko gives her all in a hell-for-leather account. I’ve never been convinced by Netrebko as a bel canto singer, but that isn’t a problem here as she wears her heart on her sleeve like a true Romantic. She also blends well with her companions, though, most especially Joyce DiDonato in the Quis est homo. DiDonato’s voice carries beautiful purity in contrast to Netrebko’s lustrous silkiness and her Fac, ut portem really pulls on the heartstrings. Lawrence Brownlee has a marvellous ring to his voice, rising to a great climax in the Cujus animam but blending into the ensembles well, while Ildebrando d’Arcangelo brings dark grandeur to the bass solos, most notably the Pro peccatis. The Santa Cecilia chorus sing magnificently too, most especially in the unaccompanied Eja Mater, and their vocal colour burns with unmistakably Italian energy. If you want the Stabat Mater as a prayer then look somewhere else, but I found this disc absolutely enthralling: after the final bars had stormed out of my speakers I even found myself letting out an involuntary “bravo”! An excellent release and yet another feather in the cap of all the performers.